(Newser) – What drove the entire Gingrich 2012 senior staff to simultaneously resign in protest? 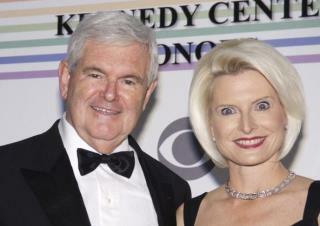 Two words, says Fred Barnes of the Weekly Standard: Callista Gingrich. Barnes doesn’t cite any sources—not even anonymous ones—but he says the aides were fed up with the amount of control Gingrich gave his wife, who essentially pushed for a part-time campaign. The final straw, apparently, was the Gingrichs’ just-concluded two-week Mediterranean cruise, which Callista insisted on despite the staff’s objections. I actually feel sorry for that goggle-eyed trollop. She has to see him naked. His fupa alone must weigh 300 lbs. She looks like she's high on meth. Scared me!